Mario Bruneau is a Paris-musette accordion specialist. Upon hearing the firsts notes, his light style of playing immediately fill the spaces with feelings of joy and joie de vivre whether it be at a public event or a private venue, people are immediately seduced. With his original and eloquent interpretations, Mario Bruneau is often referred to as the accordion poet. It is in 1992 that Mario Bruneau starts to play and learn the "MUSETTE" repertoire. In Montmagny, his participations at the Carrefour Mondial de l’accordéon de Montmagny where noticed especially his performance at the first edition of "Les Concert au clair de lune" of the Centre Éducatif des Migration. In 1999, he was invited to "Les Rencontres Européennes de l'Accordéon" of Chartres in France. 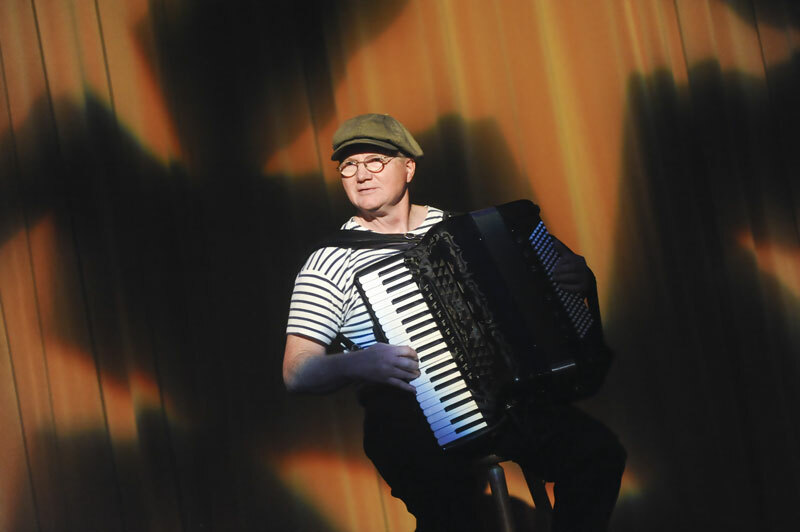 From 1997 to 2004, he was the accordionist of le Bateau-Mouche in old Port of Montreal for which he produced the musical theme (listen to the musical theme of the Bateau-Mouche .mp3 5Meg) In 2006, an Italian accordion manufacturer from Castelfidardo hired Mario Bruneau to perform at their Frankfurt MusikMesse's booth in Germany. The video on the right highlights Le Grand Frisson, a concert hall he opened in a Church. Anywhere there is good food and good wine! Private party, event, congress, wedding, corporative, concert, restaurant, wedding anniversary, intimate concert, reception hall, promotion campaign, etc. Please note that those rates are for a two hours performance. Add $100 for each additional hour. "I can hear signing Angels coming out of your accordion"
It is by deepening his accordion knowledge that he became interested in its history, manufacturing, its morphology, tuning and new technological developments that he came to tune and repair his own accordion. To share his knowledge and passion, he created the MultiMedia Accordion Conference that he presented in 2008 at Montmagny. To evaluate your accordion, please send me photos. For me, the Internet or WWWeb is an important source of music and musical information that is otherwise arcane or remote. I enjoy that people take the time to record a performance on a street corner or tiny hall in some part of the world I may never visit. Often these recordings are so poorly recorded or the “noise” so great that little that is actually musical remains. Even people intending to demonstrate an instrument and all its virtues often neglect to set properly for sound reproduction, or do anything in post production to convey the actual auditory experience. I must commend Mario Bruneau for paying attention to these important details in faithfully recording the musical experience he wishes to convey. The sound of his accordion, or other instrument, is rich and vibrant. His performances are polished as if the Internet audience deserves no less than the concert hall. Thank you Mario for sharing your great reservoir of talent and knowledge with anyone in the world who might have access to the Web and a desire for an uncommon musical experience.